At Christmas, Maxwell never often ask's for many items. 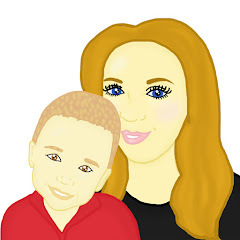 He has a few items which he says he would like however I know if we do not manage to get them for Maxwell he will understand and ask for them at a later date. This year Maxwell asked for a robot. Having looked around on Google and at Amazon reviews I found searching for one quite a tricky procedure. 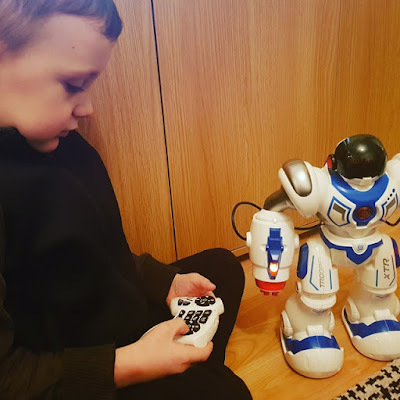 I was unsure what was worth the money and what robot included the best features, be suitable for his age and last however when I saw the Xtrem Bots Tropper Bot on Amazon I knew I had struck gold when I decided to read the reviews online about it. Maxwell recently got sent an Xtreme Bot Tropper to review. When the bot arrived I was shocked at the size of it. It was very large, very white and had wires coming out of him. Due to how plastic looking he was I was wondering if he was worth the price tag however as soon as we had set our Xtreme Bot Tropper up, I knew instantly he was worth the price tag and would provide so much fun to any one who met him. Aimed at children 5+ the Xtreme Bots Tropper Bot is a rechargeable hi-tech robot. The controller runs off 2 AA batteries however the robot is charged via a USB charging cable. To charge the robot you need to ensure he is turned off. 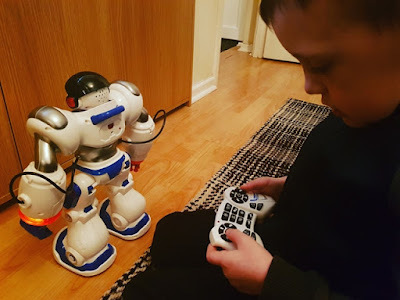 You are then able to charge the robot by plugging the cable into his back and then charging the robot off a USB connection. I found that I was able to charge the robot off my laptop. Once the Xtremem Bots Tropper bot is fully charged, you are able to get around 2 hours use from him which I think is amazing. It is lovely to find a product which does not rely on batteries constantly and can be charged using other methods. Once the Xtreme Bot Tropper Bot is fully charged, you are ready to use him. You are able to turn him on and off on his back however he also features a standby button on his front which you press to activate. If you do not use the bot, after 2 minutes he will go to sleep. To start using the bot, you have to use the controller to operate him. At a first glance, the controller looks hard to understand however once you have tried out most of the buttons once, you get a feel for what each button does. I did worry Maxwell would have trouble learning what button did what however he did not have a issue with using the controller either. 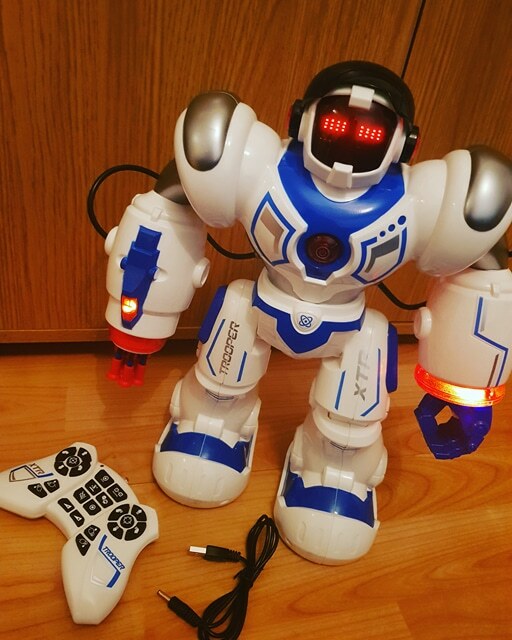 Along with these features, the Xtrem Bots Trooper Bot can also move his hands up and down with a range of buttons allowing for this to happen and the Xtrem Bots Trooper Bot can also move around the room with ease thanks to another set of buttons. Maxwell's favourite feature on the Xtrem Bots Trooper Bot is that the bot is able to shoot out missiles. There are 5 included with the bot and they are small and soft enough not to injur someone if they are shot at but they are small and nibble to glide through the air and hit smaller day to day items which your child may be interested in shooting. Once the missiles have been shot, they do need reloading which can be done in a matter of seconds. As a family of 3 from the ages of 6 to 29, we have all had fun using the Xtrem Bots Trooper Bot. The Xtrem Bots Trooper Bot is not just for children, he is also suitable for adults to have a lot of fun with. I can see that he will be a firm favourite in our house for a long while and I am so pleased that Maxwell loves his robot. 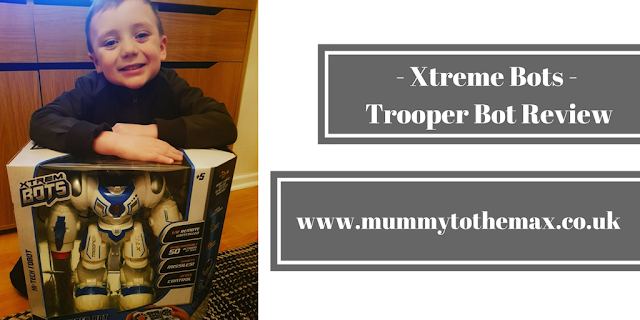 The Xtrem Bots Trooper Bot is a good quality product which moves well, walks on hard or carpeted surfaces well and is very steady on it's feet. The bot is easy to operate and provides hours of entertainment.